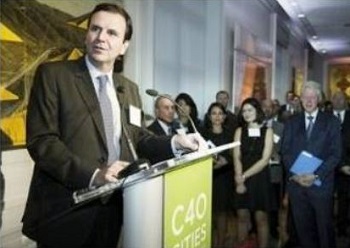 PARIS, France, December 4, 2015 (ENS) – A first-of-a-kind network that empowers megacities to integrate public transportation best practices has been created in a new partnership between MasterCard and the C40 Cities Climate Leadership Group. With technology and expertise from MasterCard, the C40 Mobility Management network will enable the sharing and activation of information to optimize all the modes of public transportation available in a city. The partners are placing special emphasis on the megacities of China. “By putting a particular focus on Chinese cities, the C40 Mobility Management network acknowledges the country’s rapid path to urbanization,” said Mark Watts, executive director of C40 Cities Climate Leadership Group, which now includes more than 80 cities. “The proven network methodology will ensure that lessons from cities around the world are translated to the Chinese context, while lessons from China are shared with other participating cities,” Watts explained. The partners announced their new endeavor in Paris as heads of state and government are attending the COP21 climate talks, known as COP21, short for the 21st Conference of the Parties to the United Nations Framework Convention on Climate Change. COP21 is introducing a new approach to global action on climate change in which cities and non-state actors have a major role to play. And with more than half the world’s people now living in cities, urban transportation is one of the key contributors to CO2 emissions globally. “The C40-MasterCard partnership provides a compelling example of the innovative and collaborative work that cities and businesses are doing to help China, the U.S. and other nations reach – and exceed – aggressive greenhouse gas targets,” Paes said. “C40’s partnership with MasterCard to launch a new network on ‘Mobility Management’ will help cities like Rio scale up their efforts,” he said. A new C40 report shows that roughly a third of C40 cities’ action is delivered through knowledge sharing. By working together to share best practices and technical expertise, the network partners and city governments intend to accelerate action that has the potential to reduce emissions and costs and improve quality of life urban residents. City governments hard pressed for resources and time can use Mobility Management to improve transport capacity, efficiency and accessibility. It is viewed as a better alternative to investing in new infrastructure, which can be expensive and time-consuming, and can neglect efficiencies within existing systems. Mobility Management has already had an impact on a number of C40 member cities, including Milan, Italy, where the recent Area C road pricing system has delivered reduction in traffic and improvements in air quality while increasing public transport speeds. In London, the introduction of contactless transit ticketing has reduced costs and increased ridership, particularly from tourists. San Francisco is seeing the benefits of SF Park, a parking program with a responsive pricing mechanism, which has reduced cruising for parking by half. In Paris, a combination of holistic measures, including changes to parking policies and the introduction of a car sharing scheme, cycling and public transport improvements has reduced vehicle miles travelled, and emissions. New York has seen a two percent rise in transit ridership after the MTA Bus Time program was introduced.